Főoldal Digitális multiméterek Opciók Egyéb Keysight 34161A Accessory pouch for 34401A, 33120/250A, 34970A, 53131A, etc. 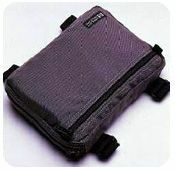 Részletes leírás Keysight 34161A Accessory pouch for 34401A, 33120/250A, 34970A, 53131A, etc. The Keysight 34161A Cordura® pouch fits on top of the Keysight 34401A and 34420A mulitmeters, as well as the 34970A and 34972A Data Acquistion/Switch Unit. Its dual zippered compartments can hold manuals, power cords and other accessories. It will fit most 2-slot, half rack sized Keysight instruments. The Keysight 34161A is compatible with the Keysight 34401A and 34420A DMMs, the Keysight 34970A Data Acquisition/Switch Unit, the Keysight 33120A and 33250A sources, the Keysight 53131A, 53132A and 53181A counters, most E3600 power supplies and other 2-slot, half rack sized Keysight products. Videók és letöltések Keysight 34161A Accessory pouch for 34401A, 33120/250A, 34970A, 53131A, etc. Kapcsolódó termékek Keysight 34161A Accessory pouch for 34401A, 33120/250A, 34970A, 53131A, etc.